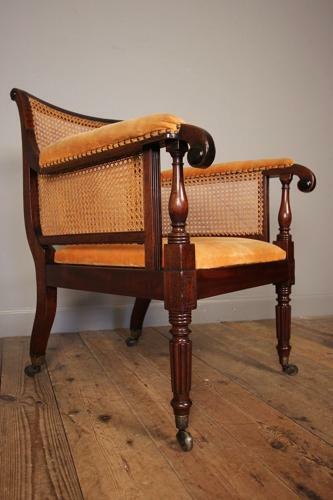 A wonderful rare George III Mahogany Bergere with great colour and patina. The large chair having a cane back, upholstered arms and pop in seat and ready for re-upholstery. Raised on a reeded front leg and splayed back leg with original brass cup castors. Having a reeded back rail, scrolled arms with carved roundels. English, George III.